Do you wish to make a difference by unfolding your love story before their eyes? Do you wish to add a personal touch to wedding invitations? Go for any of these customized photo booth wedding save the date magnets. 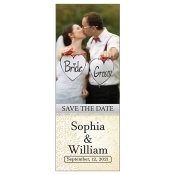 Perfect for announcing your wedding in a classy and emotional manner! We offer free full color printing on all custom magnets which allow couples to go overboard with their creativity. We can ship these customized magnets free to homes anywhere within the contiguous USA. 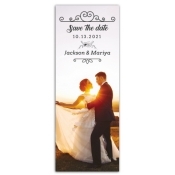 Save the date magnets are perfect to announce the wedding and to attract guests to your venue. Most of the times, these invitations are followed by rich and elaborate paper wedding invitations. What if you can offer a combo of a save the date and elaborate paper invitation? 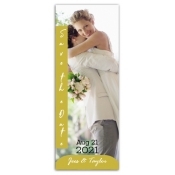 Yes, that can be easily done through these personalized photo booth wedding save the date magnets. 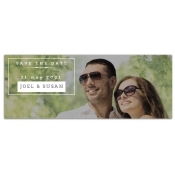 Unlike other wedding invitations, these customized photo booth save the date magnets score high on emotional quotient. People cannot take their eyes off them and they love to retain them with pride. Every look over this magnet will remind them about the sweet relationship that you share with them as a couple. No doubt, guests will be compelled to make it to your union at the altar. 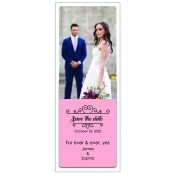 The limitations of these customized save the date magnets are not set by any boundaries because they are applicable to all themes and situations. This means it doesn’t matter, whether you wish to get married in a church, at the beach, garden, mountain or any other place because you can still add a romantic element to your invitation. It suits couples working in all budget sizes because we offer attractive discounts on bulk orders of these personalized magnets. Avail free art setup, free online design proof and lowest price match guarantee on all orders. You need to share your pictures and details with us at art@CMagnets.com or at the end of the upload page. If you do not have any specific design in mind, we can help you to present your love story in the most romantic way, you can ever imagine! To know more about savings, art set up and more, feel free to contact us at 855-762-4638 (Toll Free) or write to us at info@CMagnets.com.